B ordered a new ice cream maker for the cottage and she has made a couple of batches, but I wanted to try something adventurous and yesterday afternoon I whipped up a batch of Salted Caramel Ice Cream. I followed the recipe and let it chill. I had never used the ice cream maker before, B and her sister had made the first couple of batches, so I had to read and re-read the instructions to make sure I wasn’t missing anything. I patiently added the ice, then the rock salt, then more ice, and more rock salt. The machine churned and churned and slowly it began to slow down and I knew it was ready. I tasted it and it tasted rich, creamy, sweet and salty, but the texture needed to be firmer for later in the day. 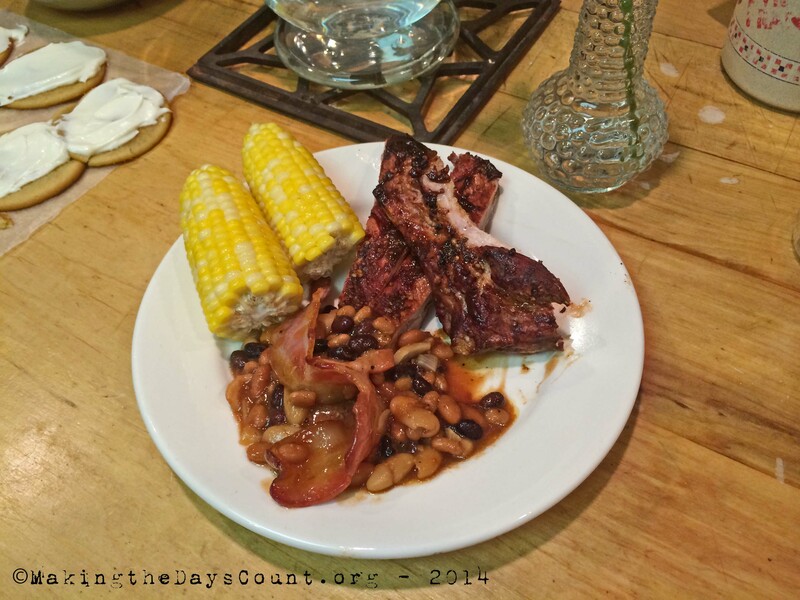 I finished a few chores and began to prepare dinner – ribs, baked, beans, and corn on the cob. 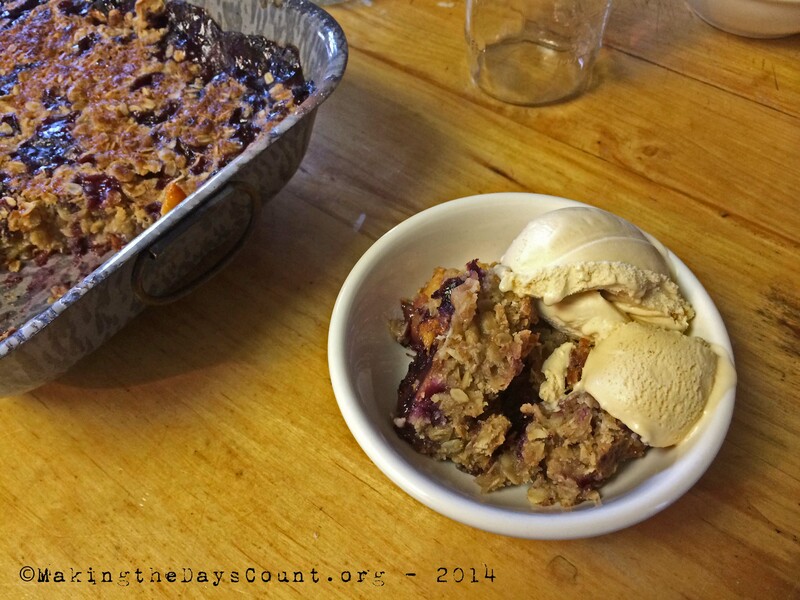 Usually, I am the camp cook, but B joined me in the kitchen and she whipped together the peach and blueberry crisp. Cooking dinner took longer than I expected and we finally sat down to eat just after sunset, there was enough light to see, but it wasn’t the plate appeal – seeing the food, but the tastes and textures of the food that made dinner good. Pork ribs sweet savory and smokey with hint of spice, gnawing every bite off the bones. Corn on the cob buttery, salty, crunchy, wet, and sweet. Baked beans with crispy bacon on top sweet, hot, slightly spicy, and smooth underneath. B’s crisp was out of the oven and ready to eat, but we were all to done from a day on the lake to sit down and eat it. Plus, our guests arrived – my nephew and his girlfriend and their new puppy – from Ohio and the visiting ensued. Ivy and the puppy met and wanted to play. The kids wanted to play with the puppy, especially O. And we all wanted to visit, catch up, and talk about plans for Saturday and Sunday. This morning, I spooned out some crisp, gently reheated it in the microwave, and scooped out some of the ice cream. It was delicious. I can’t wait to share with everyone today. It’s our last Saturday up North and we pack up and leave sometime tomorrow. We have some packing, some cleaning, some chores, and whole lot of fun to squeeze in before now and the time we leave. Today is gonna be a great day, it’ll be layered in all sorts of textures – fun, work, duty, and more fun. Making the days Count, one day at a time, one big bite, one small bite, one savory bite, and one slow bite at a time. What is one of you favorite summer foods? Today’s post is in response to the Daily Post’s Weekly Photo Challenge – prompt – at Word Press. The week’s prompt is “Texture.” This week, share a texture found in an unexpected place. It could be made of natural materials, as in these images, or with man-made objects. This is a great opportunity to look at the world in a slightly different way — along with looking at things from new angles, zooming very far out or very far in are both great ways to create texture and pattern in photos. Not sure about the feel, but I bet that would all taste great in my mouth! I love cooking too. Those corn on the cob, ribs, and baled beans looks delicious. My wife got the ice cream make because we had one and then we didn’t – it must’ve been discarded because it didn’t work… anyway she remembers making ice cream with her dad and wanted to relive some of the memories… it’s been a good and not so good summer as we lost him in June. He was a great man and positive influence on us all, and he made a great ice cream. Thank you for swinging by – have a great week! 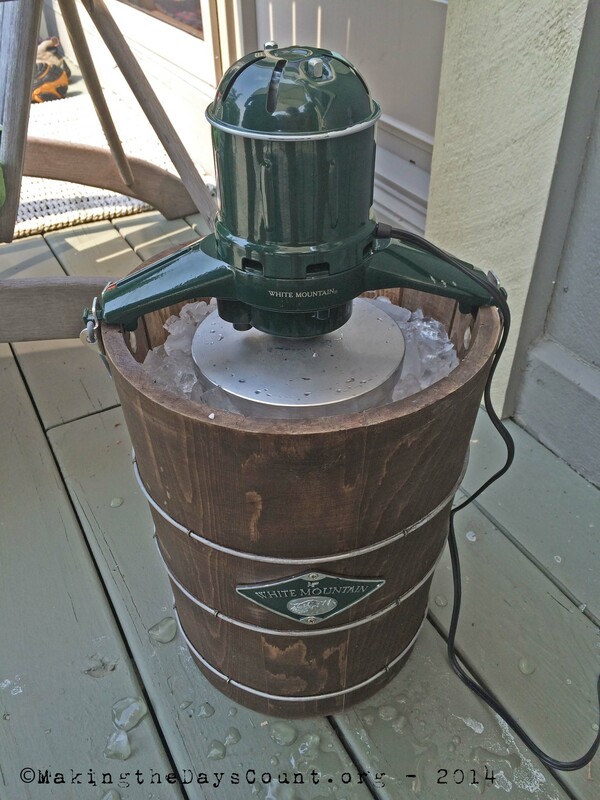 That’s some ice cream maker. It really looks the business. Do you have damsons in early Autumn? Because if so, they make the very best ice cream. Ever. But our favourite summer pudding is, er, summer pudding. It’s quintessentially hot sunny days under a perfectly blue sky: http://www.bbcgoodfood.com/recipes/4516/summer-pudding. If only – none on the go just now. But watch out for my posting about mulberries soon…….. Have a great ice-cream indulging week! I’ll be keeping an eye open!